1980 couldn’t come quick enough after 1977 gave us Star Wars leaving us wanting more. The Empire Strikes Back. Sounded ominous but boy did it sound like a lot of fun. As a 9 year old boy going to the Odeon Cinema in Chesterfield with my 6 year old brother this was so exciting. As with Star Wars we had to line up to get our tickets and boy was it worth it. I’m not going to spoil it for the 4 people who haven’t seen it but the reveal was like no other we had experienced. Noooooooooooooo. This being the middle part of the trilogy it was purposefully darker (well, look at the title), yeah there would be adventure and fun but we were not to be molly-coddled as an audience. This was our generations ‘head in a box Seven’ moment and no-one could have seen it coming. We were reintroduced to our heroes, Luke, Leia , Han, Chewie, 3P0 and R2 and the evil Darth Vader. We are introduced to new characters; the smooth as silk-Lando Calrissian and the Emperor but no-one expected the world, nay universe, to fall in love with a muppet. Enter Yoda, an 800 year old shaman, mystic Jedi who would teach young Luke the ways of the Force. And so, many more quotes were released into the world that are as popular now as they were back then. 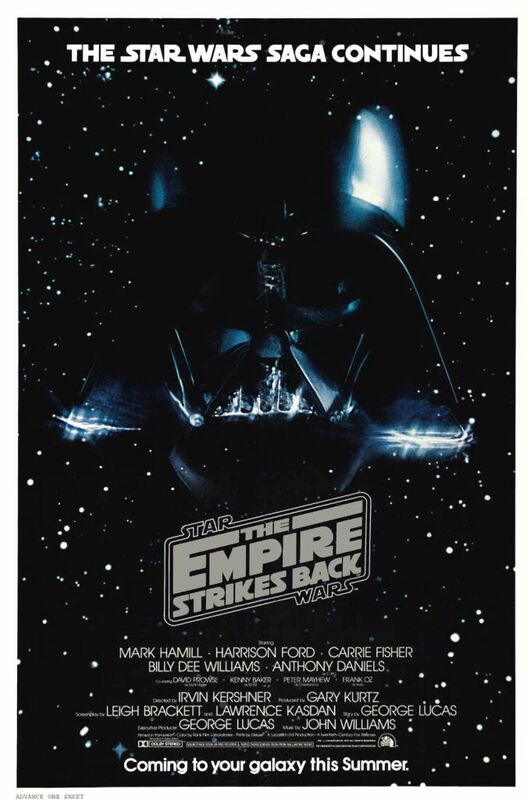 Here the director was Irvin Kirshner, with George Lucas taking an ever so-slightly back-footed Executive Producer role here, but make no mistake he was heavily involved in all aspects of this film. Written by Lawrence Kasdan (who also wrote the screenplay for Raiders of the Lost Ark, Return of the Jedi and The Force Awakens (along with JJ Abrams) and Leigh Brackett, here we get much more depth and layers in the characters. A New Hope set up the world and Empire took us deep within the heart of it. This is the dark middle of the trilogy, limbs are lost and a massive reveal that made its way into the cultural pantheon regarding family was birthed. The Empire Strikes Back immersed us firmly into the Star Wars universe and allowed us to get lost (and found) in the drama onscreen. Too much has been said about this benchmark blockbuster so I’ll try and keep it on a personal tip (as opposed to a ragga one). Before we had a video machine, myself and my 2 brothers would hire out a video player and four video tapes for the weekend from our local video store. I would set my cassette player next to the television and record the audio from all three Star Wars films to listen to them at a later date. (original pirate material). The magic that this created in our minds was epic, being transported away (albeit only aurally and imaginatively) into this world to be told this epic tale of a simple farm boy, a princess and a smuggler and some robots in space was all we needed to be entertained. As we had only had the chance to see them a couple of times each when they were first released at the cinema, listening to the tapes was infinitely better than not having anything. That says a lot about the effect they had on us. 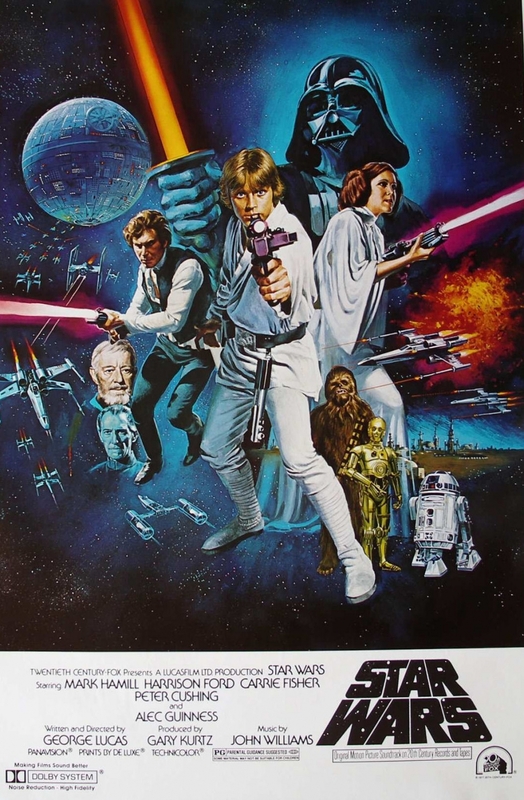 Star Wars changed everything; what was possible in film, indeed it transformed a great deal about the film industry in Hollywood and would have an effect on how films were marketed, distributed and sold around the world. George Lucas wrote and directed this film and frugally kept most of the rights to all merchandising, this had never been done before and along with the founding of Industrial Lights and Magic, the effects company that went on to revolutionise what could be done with special effects in film, he made more than a stack of dough over the years. Coming off the back of directing the sci-fi film THX 1138 and the coming of age film American Graffiti, he was very much part of the new auteur directors of Hollywood of the late 1960’s/70’s. These original movie brats, Martin Scorsese, Francis Ford Coppola, Steven Spielberg, Brian De Palma and many more were responsible for some of the greatest American films ever made, taking a leaf out of the much more experimental French Nouvelle Vague cinema and eschewing the Old Hollywood way to make films that were relevant, fresh and exciting. The seventies. Watching Star Wars again 38 years after it was originally released there is no doubt that it’s a classic that stands the test of time. Up until 1999, the original trilogy was viewed a once a year or two, however when the ‘prequels’ came out my appetite for the annual/bi-annual revisit waned. So, with The Force Awakens coming out, it was time for me to go back to the source and what joy it was. Star Wars-Episode VI A New Hope is pretty much a perfectly constructed film, it sticks to a three-act narrative and follows the hero’s journey faithfully and so, successful story-telling achieved. The three young stars, Mark Hamill (Luke Skywalker), Carrie Fisher (Princess Leia) and Harrison Ford (Han Solo) were thrust into the limelight to be cemented into cinema lore along with such incredible characters as Darth Vader (“I find your lack of faith disturbing”) surely one of cinema’s greatest villains, Chewbacca (aaarrreeeeooooggghhh), the loveable robots C3P0 (“R2 it is you, it is you”) and R2D2 (bleep sounds); these two characters, incidently were based on characters from Akira Kurosawa’s The Hidden Fortress, which is definitely worth a look if you are a Star Wars fan, the two peasants (3P0 & R2), the rescuing of the princess, the dark baddie and the music from this Japanese classic heavily influenced this modern space-western; along with the films of John Ford, The Wizard of Oz, Metropolis and others. Obi Wan Kenobi, played with grace and gravitas by the wonderful Sir Alec Guinness (“But of course, I know him. He’s me), the now iconic Stormtroopers, the Jawas (awh-tee-chee), Peter Cushing’s evil Grand Moff Tarkin (“Enough of this. Vader release him”). Not forgetting John Williams’ opus of a score, a true character in the film. And of course, The Force “One all powerful force controlling everything”. This was Lucas bringing in an element of the mystical, a religion without the controlling aspects of our lovely religions here on planet earth, actually this controlling aspect of it seems to be The Dark Side. The Force was shown as more spiritual and the kids of the 70’s and 80’s lapped it up. It helped the New Age scene grow, for sure. What sets this apart from most space films is that it defies genres. It has everything; a love-story, comedy, mysticism, action, drama, war, sci-fi, I could go on. It does what all those niche genres aspire to do, better that many of the greatest films of each respective genre. Star Wars refuses to be compartmentalised. It is an every person’s film; there is something in it for everyone. My only concern watching it this time is the heavily re-mastered element to it. Gone are a lot of the old Henson creatures replaced with soulless Computer Generated Imagery. I don’t have a problem with a director tinkering with his or her work years later but what I find annoying, offensive, almost book-burny, is the fact that the original versions have been taken off our shelves at the request of Mr Lucas. There is more than a little element of ‘these are my toys and they shall be played with how I say’. Spoilt, unnecessary and childish. When they released this film in 1977, Lucas and the other collaborators who were birthing the technology were limited, over the years however, the technology has grown and so, by all means tinker tailor away, but what of all those people who went to the cinema in 1977 and have a fondness, a long-lasting memory of the original version of the film? You deny them? I heard that Disney will be re-releasing the original untouched trilogy soon, well of course they will, there be a lot of money to be made for the company but aside over, I look forward to that day. Until then, the re-mastered editions are all we have access to, but that’s all good, they are still exquisite. If you are one of the few people on this green planet that hasn’t seen Star Wars-Episode IV A New Hope and you are interested in film and cinema, what is wrong with you?